Delivers high yields without sacrificing sweet flavor and outstanding texture. Bright white kernels grow on 8 in. ears in 16-18 even rows. With great tip fill and attractive, dark green husks, it's sure to be a favorite at markets and home gardens. Excellent for eating fresh, canning and freezing. Super-sweet hybrids have extra sweet flavor and crisp texture; they also have a higher sugar content than (se) and (su) varieties of sweet corn as well as a slower conversion of sugars and starches. They hold their quality for more than a week after picking. Approx. 250 seeds per pkt. 76 DAYS. Spacing: 10-12 inch plant spacing. 36 inch row spacing. Plant in blocks of at least 4 rows for adequate pollination. Foliage: Attractive, dark green husks. 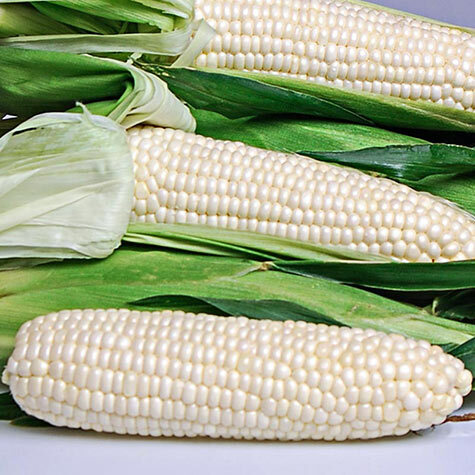 Fruit: 8 inch ears of 16-18 even rows of bright white, sweet kernels with great tip fill. Ears are set at 24 inches. Seed Count: A packet of 250 sweet corn seeds sows a 50-ft. row. A 1/2-lb. packet of sweet corn seeds (approx. 1000 seeds) sows a 200-ft. row. Comments: Outstanding sweet flavor and texture with the benefit of being a vigorous grower that produces high yields. Bright white kernels grow on 8-in. ears in 16-18 even rows. Great tip fill. Attractive, dark green husks. Easy to pick.